I don't have to say much, all of you know me by now, ^^. 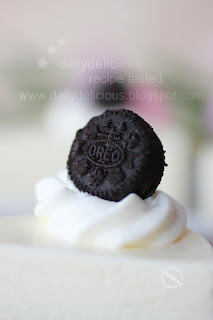 I start to think that maybe one day I will have 100 recipes with Oreo as an ingredient in my blog, haha. But I think you won't mind to see a lot of it, right? 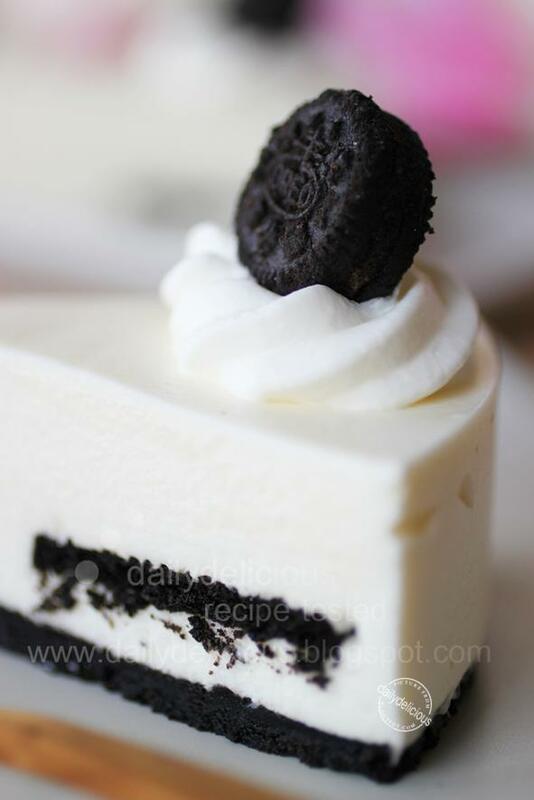 For me Oreo always be a symbol of comfort and happiness, the reason of this feeling is very simple, the delicious food from our childhood always bring back good memory. I just find one more quotation that catches my heart "People aren't rich because of money but because of their memory" (from Tissa Kiros), ^^ for me all my memory filled with good thing about food and family, and yes, I think I'm a millionaire by now, haha. So, I never wait for anything that will make me feel like a little kid again. "Fraisier" I still think that this one is not bad at all. Because I believe that even you try so hard, fault can happen, and for us who live our life by reading the recipe (haha), all we have to do is read the recipe more carefully, that all. 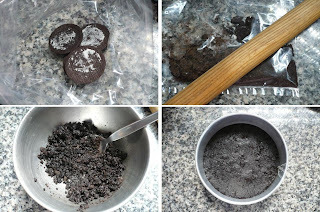 The only problem for this recipe that I found is the quantity of the Oreo cookies in the original recipe is too little, I don't know the size of the Oreo that sell in Japan, but my Oreo is about 4cm in diameter, anyway if yours is bigger you can reduce the cookies that you will use in the base (or use the same quantity and have a thicker base, that I think it's still delicious, ^^). 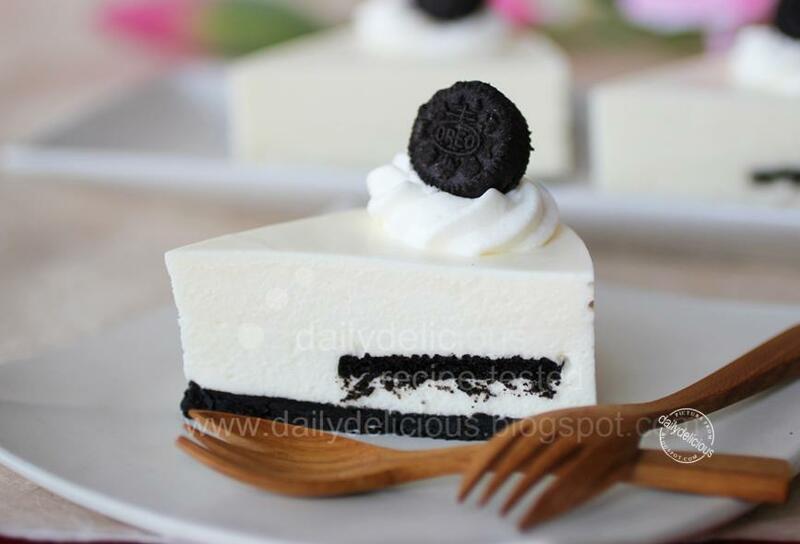 This cake is very easy to make, and don't require any special equipment. But if you love to bake and make a lot of desserts, I suggest you to buy a bottle of Kirsch, because a bit of this liqueur will make your dessert and can much more delicious. Kirsch is a clear, colorless fruit brandy traditionally made from double-distillation of morello cherries, and the smell of Kirsch is cherry like. There are a lot of brands to choose from, as always I recommend that you buy the one that you can taste it by it own. I don't have to say much about this cake, the only thing that I will tell you is "It's delicious!!!!!!!" Take the filling out of the cookies. Crush the cookies with the rolling pin. Pour the melted butter into the cookie crumb, mix to combine, then put all the crumb into the cake pan with removable bottom or cake ring, press evenly. Refrigerate until require. Bloom the gelatin sheet in cold water for 5 minutes. Discard the water and pour the Kirsch into the gelatin bowl, melt the gelatin by placing the bowl over the hot water (or warm in microwave for 10 seconds, stir until melt). Beat the cream cheese until soft (you can make the cream cheese soft and smooth by placing the bowl over the warm water). Pour the sour cream in beat to combine, follow by sugar, lemon juice, and gelatin mixture beat to combine. 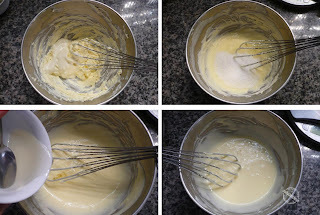 Whip the cream until soft peaks, spoon 1/3 of the cream into the cream cheese mixture fold to combine, then pour the cream cheese mixture into the whipped cream and fold to combine. Pour half of the filling into the pan, place the cookies over, then cover with the rest of the filling. 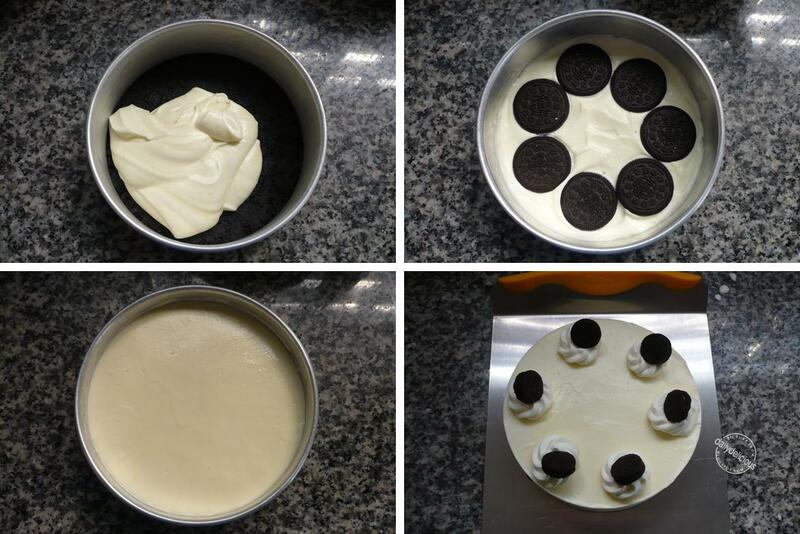 Refrigerate until firm (about 12 hours), take out of the pan and decorate with whipped cream and mini Oreo. I think Grand marnier will be OK for this recipe ^^. Hi pook, ur cake look so lovely...i also like it very much. You can use water, or 1/2 tsp of vanilla extract with water. This very beautiful! I made something similar today but without the oreo. Must try this next time. Thanks for sharing! Omg, am speechless and cant take my eyes from clicks, wonderful.. 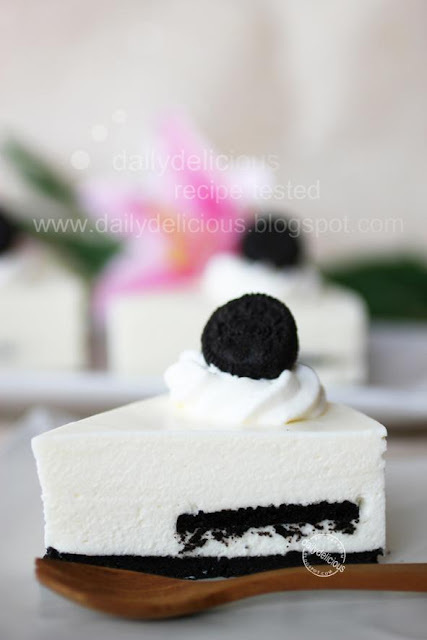 This is a beautiful cake,I will never get tire of oreo too. 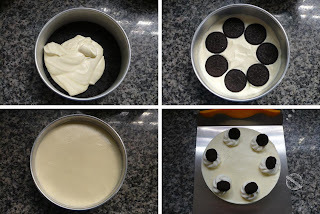 How did the cheesecake turned out to be so whitish, like snow? You used Philidapehia cream cheese? firstly just wanted to tell you that your cakes look amazing! and secondly would like to confirm if it is ok to use powdered gelatin in the same quantity instead of the gelatin sheet? and also you mentioned that we could substitute the kirsch with water right? is 10ml of water almost the same as a teaspoon? thanks! yes you can use gelatin powder instead of gelatin sheet, and 10ml of water is 2 teaspoons ^^. can replace Kirsch with rum? Yes, you can use rum instead of Kirsch. I really like your blog. Your cakes look so beautiful! Someone asked about gelatin powder to replace the gelatin sheet, i would like to ask whether the amount is the same? 3g of gelatin powder? Thank you for your compliment ^^. Yes, you will need the same amount of gelatin. Thank you very much fir sharing such a delicious and easy recipe. I made this cake yesterday for a friend of my husband. They had a cake today at work and they love it. Your cakes are simply amazing! I love them all!!! I am really interested in trying this out. Just a quick question, how many gelatin powder should i use to replace the sheets? You will need about 1tsp of gelatin powder (the weight will be almost the same). could it be that i added too little gelatin powder? what would you suggest to make the cake body firmer? You may have to press the base more firmly to prevent it to be crumbly. For the cake, you will need more gelatin ^^, (the strength of each brand can be varied), add about 1g more. how I can demould this cake. You have to use removable bottom cake pan or cake ring, and you can demould it easily. I am going to use springform pan. Could you please tell me how can I remove the base without breaking it? It will be easier if you line the base with baking paper, and warm the side of the pan before removing the cake out of the pan. I have try making it and have some Qns. I have replaced kirsch with water as you said and when i add the whipped cream into the cream cheese mixture , it didnt turn out as creamy as yours (abit watery)... what did i do wrong is it becoz of too much water ? Only 10ml of water don't effect the texture that much, the point is our gelatin can be different in strength, add about 1g will help. The other thing I hope you didn't use low fat or spreadable one ^^. Im trying to make the delicious looking cake but in the process im unable to whip the whipping cream it always be overwhip be4 it even turn to soft peak , any solution? ? 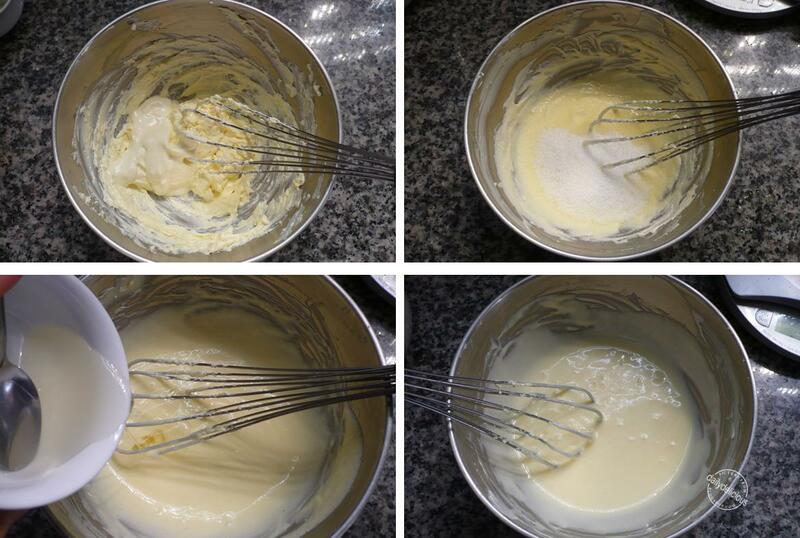 Try to whip the whipping cream with a whisk not an electronic hand mixer, you will be able too control it better. May I know your topping whipped cream recipe as I found that it tends to melt easily when left in room temp for quite sometime. Thanks alot! Actually I use simple recipe: whipping + Icing sugar. Mostly the ratio is 10 g of icing sugar per 100g of whipping cream. You can buy it from liquor conner in almost every supermarket.